Artists Adrian Kohler and Basil Jones describe their War Horse puppet as an “emotional prosthesis.”* It takes three puppeteers working together to create all the movements, noises and personality of the each horse used in the show. Every breath that the horse takes is a masterful co-ordination of horsiness three puppeteers have worked months to create before ever performing in front of an audience. To act like a horse requires the actors to understand a horse’s point of view. 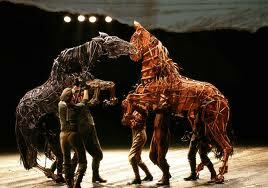 If you were the director of War Horse and you needed the puppeteers to get into the role of being a horse, what kinds of training exercises would you have them do? Be sure to consider the constraints of three puppeteers working together to create the perfect impression of horsiness on stage.